Home › Investing › What Is A Mutual Fund? Any financial advisor worth their salt will tell you that you need to build a diversified portfolio to spread your risk and to focus on the long term when building your retirement nest egg. But how do you construct a portfolio of stocks and bonds that meets your objectives, aligns with your risk tolerance, age, and time horizon? And how do you save yourself the time of researching stocks and bonds to add to your brokerage or retirement accounts? These are the problems that mutual funds solve. Mutual funds pool your funds and those of other investors to buy a collection of stock and bonds, and sometimes other assets. Mutual funds then charge you an ongoing fee for operating and managing the fund. As with many other investments, mutual fund returns are variable, so you risk losing money when things go awry with fund holdings. But the value of buying a mutual fund is that you are buying a diverse group of securities so the risk is not concentrated in any single position as it would be if you bought an individual stock or bond as opposed to a collection of stocks or bonds. How Much Does It Cost To Invest In A Mutual Fund? What Types Of Mutual Funds Can You Invest In? When you invest in the stock market, you will discover two opposing investment philosophies. Those who believe they can beat the market fall into the active investor group. These investors believe that they can outperform the returns of benchmarks, such as the S&P 500. By pursuing the lofty endeavor of beating the market, these investors take on the risk of falling short of the mark, and underperforming a benchmark index. The opposing group of investors are those who believe it is not possible, or very difficult, to beat the market. These investors are content to simply track the returns of an individual benchmark. They don’t try to beat benchmark indices but equally they don’t underperform them. Mutual funds can be either passively managed or actively managed. Over a long time period, few investors consistently beat the market. For this reason, passively managed mutual funds and index funds have become ever more popular. Even when managers do beat the market for a sustained time period, mutual fund investors may not enjoy the spoils entirely because fees are withdrawn at the fund level to pay for fund management and ongoing operational and regulatory compliance costs. For these reasons, most robo advisors subscribe to Modern Portfolio Theory, which is an investment theory created by Dr. Harry Markowitz premised on the idea that risk-averse investors can build portfolios to maximize or optimize expected returns based on a given level of market risk. In a nutshell, this means that risk and reward are tied together. To achieve higher returns, you must take on more risk. A rare exception among robo advisors is Hedgeable, which seeks to better protect clients from stock market downturns and stock market crashes. Invest In A Mutual Fund? Fees are a big deal when choosing a mutual fund. Most investors are aware that a financial advisor charges a management fee, but few pay as much attention to the fees charged by mutual funds. These fees are easily overlooked because they are not charged directly to mutual fund holders, but instead they are charged at the fund level. So the mutual fund performance returns you enjoy are reported after fees have been withdrawn. But just because you don’t see the costs on your monthly statements doesn’t mean you shouldn’t have an eagle eye on how much you are being charged for investing in the mutual fund. When you combine the management fees of a financial advisor with mutual fund expense ratios, you may discover that you are paying more than you think. For example, if you compare two portfolios of $100,000, both of which are invested over a 30 year period earning returns of 8% annually, their values are starkly different at the end of the thirty year period depending on the levels of fees applied. The investor paying just 0.5% in total fees annually turns $100,000 into $866,507 while the investor paying 2.0% in total fees annually sees their portfolio increase to $550,388. So, what seems like a small fee difference of “just” 1.5% each year ends up costing the second investor a whopping $316,000 in portfolio value over the thirty year period. >> More: What Are Bonds? Mutual funds fall into various categories of risk and return, including equity, bond, income, hybrid, and money market. Equity funds that comprise a diversified group of stocks are among the most popular mutual funds. Of all the mutual funds available to you, equity funds offer perhaps the greatest upside reward opportunity but also have commensurate levels of risk. One way to sidestep the expense ratios charged by mutual funds while still enjoying the benefits of diversification that they offer is via a company called Motif. Motif lets you buy a collection of stocks or ETFs inexpensively under a single umbrella via professional motifs or community motifs. Professional motifs are pre-built motifs that require no input from customers – much like a mutual fund. Community motifs are built by Motif customers, who bundle a customized selection of stocks or ETFs into a single motif, and can even get paid a small amount when other customers purchase those motifs. The highest tier creditworthy bonds are government bonds but the yields paid to investors tend to be lower than those paid to municipal bond or corporate bond investors. Municipal bonds can be especially attractive when you buy bonds of the state you live in because the interest earned is often exempt from state taxes. Corporate bonds generally pay the highest yields but the risk of default is higher. Unlike government bonds that are backed by the full faith and credit of the U.S. government, corporate bonds are subject to greater risk. In rare cases, corporate bonds pay lower returns than some sovereign nations pay. For example, interest on bonds issued by Apple have paid lower yields than those paid by some countries because Apple has more cash on hand than many small nations. As you transition from investing in the stock market in order to grow your nest egg to investing with a view to generating income as a retiree, consistent returns becomes ever more important. 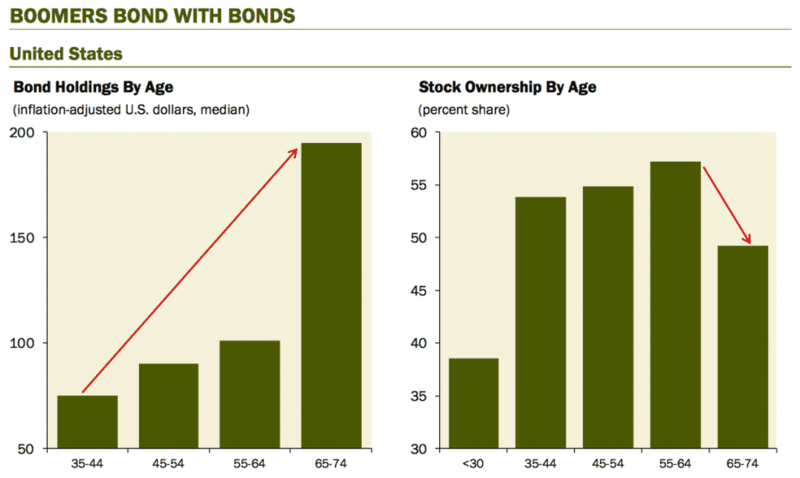 Typically, the biggest asset class change among investors takes place when aging from the 55-64 demographic to the 65-74 year old demographic when stock holdings diminish and bond holdings substantially increase. Mutual funds holding high quality corporate debt, municipal bonds and government Treasurys tend to be most attractive for conservative investors. But just because government bonds or munis are generally believed to be safer doesn’t mean you should dive in without due diligence. For example, when a state has mismanaged its finances, such as Illinois experienced, the risk of default is higher than an investor might realize. Hybrid mutual funds comprise both stocks and bonds that offer a mix of both income and higher return potential (than bond funds alone). For investors who are closer to retirement and want to limit risk yet still want to capitalize on a rising stock market without owning a pure equity mutual fund, a hybrid fund can be an attractive compromise. Generally, money market funds invest in short-term government debt and corporate debt so risk levels are very low. Money market mutual funds and bank savings accounts tend to rival each other when it comes to the interest paid. So, while you may not get rich depositing funds in a money market fund, the interest earned makes them a better place to store funds than a checking account for short time periods. For example, when you plan to buy a home and have a high level of cash on hand but cannot invest it for the long-term, a money market fund is often an ideal place to store your cash. When your goal is to track a certain benchmark index, index funds made up of equities offer a way to match benchmark returns. Unlike equity mutual funds, which generally have the aim to beat their benchmarks, index funds are usually constructed to neither beat nor fall short of benchmark performances. For example, if you are looking to replicate the performance of the S&P 500, the Vanguard 500 Index Fund aims to match both price and yield performance. The index uses a market-cap weighting structure and invests in the 500 largest U.S. firms, such as Facebook, and charges an expense ratio of 0.18%. Exchange-traded funds, also known as ETFs, generally charge lower fees than mutual funds yet still offer the same diversification benefits. For example, the ETFs listed above, IVV and VOO, track the S&P 500 benchmark while charging extremely low expense ratios of just 0.04%. Mutual funds provide you the opportunity to invest your savings in a diversified group of stocks or bonds without having to buy a large number of individual stocks or bonds. By diversifying your holdings, you lower your risk when compared to holding a small, concentrated group of stocks or bonds. By buying a mutual fund as opposed to a bunch of individual stocks or bonds, you also save on transaction costs when you buy and sell. By pooling your funds and those of others, mutual funds are a more cost effective way of building a diversified portfolio. Mutual funds do not trade during the day like equities do. You cannot buy and sell intra-day as you can shares of a public company on the New York Stock Exchange. Mutual funds exchange hands after the market closes at their Net Asset Value. When the mutual fund NAV increases in value, you make money. You can also make money with mutual funds when the funds sell a holding that has increased in value. Plus, if companies that form part of the fund pay dividends, the mutual fund distributes a portion to mutual fund holders. Beyond the costs of fees and expense ratios, a significant risk of buying mutual funds is year-end distributions. At the end of the year, you may be hit with a tax bill on capital gains distributions. Theoretically, you could buy a mutual fund in mid-December and be hit with a large tax bill the very next day. Sometimes, these distributions can be as large as 25% of the Net Asset Value of the fund, so the tax liabilities can be substantial. The way to sidestep the tax risk is to buy the mutual fund after the distribution has been made. Mutual fund companies generally publish the expected payouts, so you can avoid an unpleasant tax surprise by doing a little homework before you buy the fund. Actively managed funds generally have higher payouts than passively managed funds, and some funds have a history of large payouts so it is worth looking back in time before investing your money to examine the payout history. Another way to avoid the tax liability is to buy the mutual fund in retirement accounts, such as an IRA or 401(k), which enjoy tax-deferred growth of earnings until distributions are made. Have you found good mutual funds to invest in? Did you get surprised by a year-end mutual fund distribution? Share your comments below – we love to hear from you. >> Is Twitter Stock A Buy Or A Sell? ‹ What Is A Living Trust?